This year’s Game Developer’s Conference had a massive PlayStation event that Sony used to show off a couple of their upcoming under the radar titles. But they also announced a bunch of cool indie games coming to both PS3 and PS Vita. First, Limbo will be coming to the PlayStation Vita sometime this year. It originally hit XBLA in 2010 before coming to PSN a year after. While it’s a bit old and PlayDead are still up to something with Project 2, it’s neat and will probably play very well on the portable. 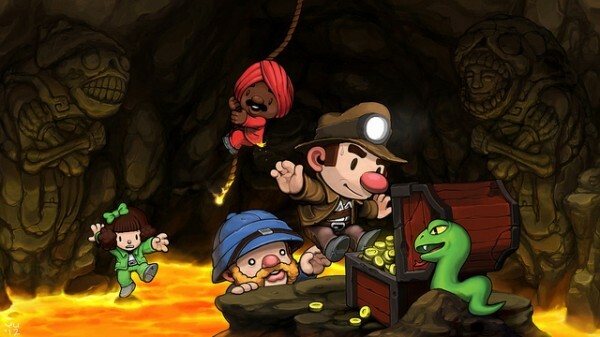 The big one (for me, at least) was my personal 2012 Game of the Year Spelunky will be hitting PS3 and PS Vita. The popular roguelike platformer came out on XBLA last year based on the original freeware game from 2008 that inspired many games including Binding of Isaac (also coming to the Vita later this year). You can see list of all the indies coming to platform on the PlayStation blog. Some of the standouts include last year’s amazing Hotline Miami, Vlambeer’s dog-fighting flying game Luftrausers, weird artistic platformer Thomas Was Alone and the two-button fighting game Divekick. All of them will also be available on the PS3 as well with cross-play and cross-buy enabled. So the PS Vita is becoming an amazing indie machine huh? I better get one then, let us know in the comments if the indies will be speaking to you to get the platform or post in our forums.